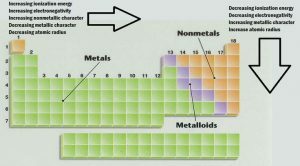 The chemical properties & some of the physical properties of the elements depend on their electronic structure and especially on the valence electrons ( the electrons of the outermost level ) , The concept of bond length differs in the covelent compounds from that in the ionic compounds , we can calculate atomic radius and ionic radius . The atomic radius can not be calculated from the distance between the nucleus and the farthest electron , Because it is impossible to determine the precise location of an electron around the nucleus ( as the wave mechanics revealed ) . But the atomic radius can be calculated by knowing the covalent bond length which is measured by Angestrom unit ( A° ) , Covalent bond length ( 2r ) is the distance between the nuclei of two bonded atoms , Atomic radius ( r ) is half the distance between the centers of two similar atoms in a diatomic molecule . Ionic radius : The ionic compounds as sodium chloride are found in a crystalline from and consist of positive ions ( cations ) and negative ions ( anions ) , Ionic bond length is the distance between the centers of the nuclei of two bonded ions , The ionic radius depends on the number of electrons lost or gained to form ions . The valence electrons are not affected by the complete nuclear charge ( the charge of the nucleus protons ) , This is because the inner electrons ( of the inner energy levels ) screen a part of this charge from the valence electrons , so , the actual charge affecting an electron is called the effective nuclear charge Zeff . Effective nuclear charge Zeff is the actual nuclear charge ( positive charge ) which effects on an electron in an atom , The effective nuclear charge Zeff is always less than the nuclear charge ( the total number of protons present in a nucleus ) , due to the screening effect of the electrons of the inner energy levels on a part of the nuclear charge affecting the electrons under study . In the horizontal period : The atomic radius decreases as we go from the left to the right across a period by increasing the atomic number from 1A to zero group . This is due to the gradual increase in the effective nuclear charge ( Zeff ) which increases the nuclear attraction force on the valence electrons leading to the reduction of the atomic radius . In the vertical group : The atomic radius increases as we go down the group by increasing the atomic number from the first period to seventh . This is due to the increase in the number of the energy levels in each new period , The increase in the number of the filled energy levels that having a screening effect on the pull of the nuclear charge on the outer electrons , The increasing of the repulsive forces between electrons . The atoms of the first group elements ( alkalis ) are the biggest atoms , while the atoms of the seventh group elements ( halogens ) are the smallest atoms , The biggest atom in size is cesium ( Cs ) . Example : 7N , 9F → ( N ) atom is bigger than ( F ) atom , because the atomic size decreases in the same period as we go from left to right by increasing the atomic number . 56Ba , 4Be → ( Ba ) atom is bigger than ( Be ) atom , because the atomic size increases in the same group as we go down the group by increasing the atomic number . The radii of atoms differ from the radii of their ions , The ionic radius decreases as the effective nuclear ( positive ) charge of the ion increases . Metals : The metal atom tend to lose their valence electrons during the chemical reaction to form positive ions . The positive ion radius is smaller than its atomic radius , because the number of positive protons in the cation ( positive ion ) is larger than the number of negative electrons , So , the pull of the effective nuclear charge on remaining electrons increases leading to decrease the size . Application : The sodium metal tends to lose its valence electron during chemical reactions to form sodium ion of radius smaller than the radius of its atom . Nonmetals : The nonmetals atoms tend to gain electrons during the chemical reaction to form negative ions . The negative ion radius is larger than its atomic radius , because the number of negative electrons in the anion ( negative ion ) is larger than the number of positive protons , so , the repulsive forces between electrons increase due to increasing the number of electrons without any increasing in the nuclear charge leading to increase the size . Application : The chlorine nonmetal tends to gain an electron during chemical reactions to form chloride ion of radius larger than the radius of its atom . Application : The atomic radius of iron atom ( Fe ) > the ionic radius of iron ( II ) ion Fe2+ > the ionic radius of iron ( III ) ion Fe3+ , because the atomic radii of metals are bigger than the radii of their ions , As ionic radius of positive ion decreases , its charge increases . If an energy is supplied to an atom , electrons may be excited and transferred to higher energy levels , but if a sufficient energy is supplied , the most loosely bound electron may be completely removed , giving a positive ion , The minimum amount of this energy is called ionization potential . Ionization potential ( Ionization energy ) is the amount of energy required to remove the most loosely bound electron completely from an isolated gaseous atom . ΔH of the ionization process has a positive sign , because the ionization energy is an absorbed energy . First ionization potential is amount of energy required to convert an isolated gaseous atom to an ion carries one positive charge . Second ionization potential is the amount of energy required to remove an electron from a positive ion carries one positive charge . Third ionization potential is the amount of energy required to remove an electron from a positive ion carries two positive charges . The first ionization potential < the second ionization potential < the third ionization potential . The first ionization potential of noble gases is very high , due to the stability of their electronic configuration and it is difficult to remove an electron from a completely filled shell . The first ionization energy of energy alkali metals is lower than that of all elements , due to the easily loss of the valence electron . The ionization potentials of magnesium : The second ionization energy of magnesium is greater than the first one , due to the increasing of the effective nuclear charge ( Zeff ) , The third ionization potential of magnesium is much greater than that of its first and second ones , because it results in the breaking up of a completely filled energy level . The first ionization potential of potassium 19K is lower than that of calcium 20Ca , while the second ionization potential of potassium is much greater than that of calcium . The first ionization potential of potassium is lower than that of calcium due to the easily loss of valence electron , while the second ionization potential of potassium is much greater than that of calcium because it results in the breaking up of a completely filled shell . In the same period : The first ionization potential increases as we move from left to right , This due to the increase of the effective nuclear charge and the decrease of the atomic radius , which would lead to increase the attraction force of the nucleus on the valence electrons , which need higher energy to separate them from the atom . In the same group : The first ionization energy decreases as we go down the group , This due to the extra shells of electrons are added which increase the atomic radius , The decrease of attraction force of the nucleus on the valence electrons , so , the energy required to remove the valence electrons decreases , So , the ionization potential is inversely proportional to atomic radius . The ionization potential of oxygen 8O is lower than that of nitrogen 7N , although oxygen comes next nitrogen through the same period , because the atom becomes more stable when the 2p sub-level is half-filled electrons as in nitrogen atom and removing an electron from it will decrease its stability . 13Al , 16S : The ionization potential of 16S is greater than that of 13Al , because the ionization potential increases in the same period as we move left to right by increasing the atomic number . 3Li , 55Cs : The ionization potential of 3Li is greater than that of 55Cs , because the ionization potential decreases in the same group as we move down the group by increasing the atomic number . The removal of an electron from the atom will convert it into a cation , which requires an amount of energy named by the first ionization energy , on the other hand , if the atom gained an extra electron , it will be converted into a negative ion , this is associated with releasing an amount of energy named by electron affinity . Electron affinity is the amount of energy released when an extra electron is added to a neutral gaseous atom , The magnitude of the electron affinity is high when the added electron makes the sub-level , half-filled or completely filled , as in both cases it helps in the stability of the atom . In the same period : The electron affinity increases as we move from the left to right , this due to the increase of the atomic number leading to decrease the atomic radius ( atomic size ) , which makes it easier for the nucleus to attract a new electron . In the same group : The electron affinity decreases as we go down the group , This is due to the increase of the atomic number leading to increase the atomic radius ( atomic size ) , so , the ability of the nucleus to attract the new electron decreases . Because the atom will be more stable when the sublevel : 2s is full-filled as in case of beryllium atom 4Be , 2p is half-filled as in case of nitrogen atom 7N , 2p is full-filled as in case of neon atom 10Ne and the addition of an electron to any atom of them will decrease its stability . The electron affinity of chlorine ( − 348.6 kJ/mol ) is greater than the electron affinity of flourine ( − 328 kJ/mol ) , although chlorine comes next fluorine through the same group . Because fluorine atom is smaller in size as it has smaller radius than chlorine atom , so , the entering of an electron will suffer a strong repulsive force with the nine electrons already existing around the fluorine nucleus which decreases the released energy due to consuming a part of it to overcome this repulsive force . When two atoms of two different elements combine together , the ability of one atom of them to attract the electrons of the chemical bond towards itself differs from that of the other atom , this attraction force is named by electronegativity , Electronegativity is the tendency of an atom to attract the electrons of the chemical bond to itself . The electron affinity differs from the electronegativity , where the electron affinity is an energy term which refers to an atom in its single state , while the electronegativity of the elements is represented by relative values and it refers to a combined atom . The increase of the relative values of the electronegativity means the increase in the ability of the element atom to attract the electrons of the chemical bond . The difference in electronegativity between elements plays a very important role in determining the nature of the bond formed between them . In the same period : The electronegativity increases as we move from left to right , this due to the increase of the atomic number leading to decrease atomic radius , so , the ability of atom to attract the electrons of the bond towards itself increases . In the same group , The electronegativity decreases as we go down the group , this due to the increase of the atomic number leading to increase the atomic radius , so , the ability of atom to attract electrons of the bond towards itself decreases . So , The atoms of nonmetals group 7A ( halogens ) are the greatest in the electronegativity , while the atoms of the alkali metals group 1A are lowest in the electronegativity . Fluorine ( F ) is considered to be the most electronegative element , while cesium ( Cs ) is considered to be the lowest electronegative element .